Qua-ah? Who or what is that? While not as familiar as other names or items used in the A-Z list, I have to say that Qua-ah’s painting is one of my favorites. 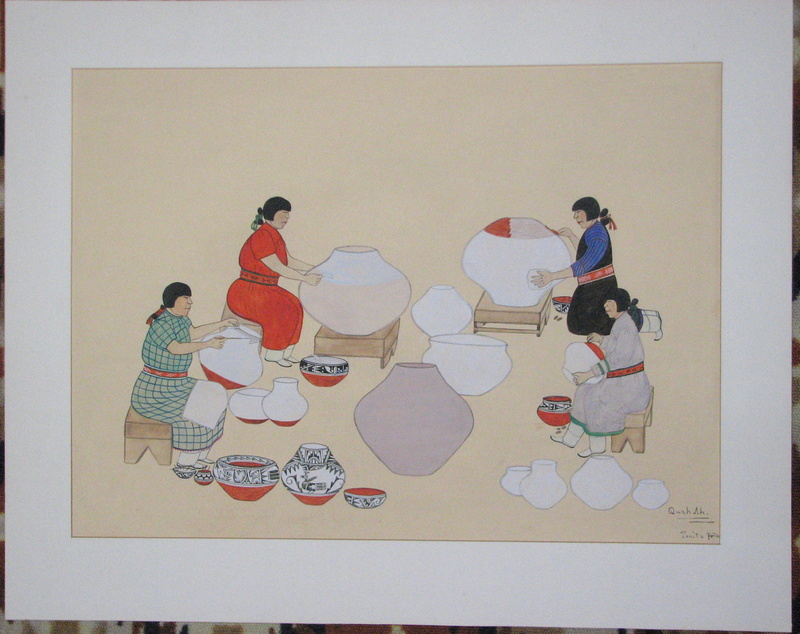 It is a 29 x 23.5″ framed and matted watercolor painting of 4 Hopi potters at work with their wares around them and is signed by Quah Ah / Tonita pena. I enjoy the tiny details of each pot. Tonita Peña, whose Indian name was Quah Ah, was born in 1893 in the tiny New Mexico pueblo of San Ildefonso on the Rio Grande, just north of Santa Fe. At about the age of 12, her mother passed away and her father, unable to raise her and tend his fields and pueblo responsibilities, took her to live with her aunt and uncle at Cochiti Pueblo, where she spent the remainder of her life. 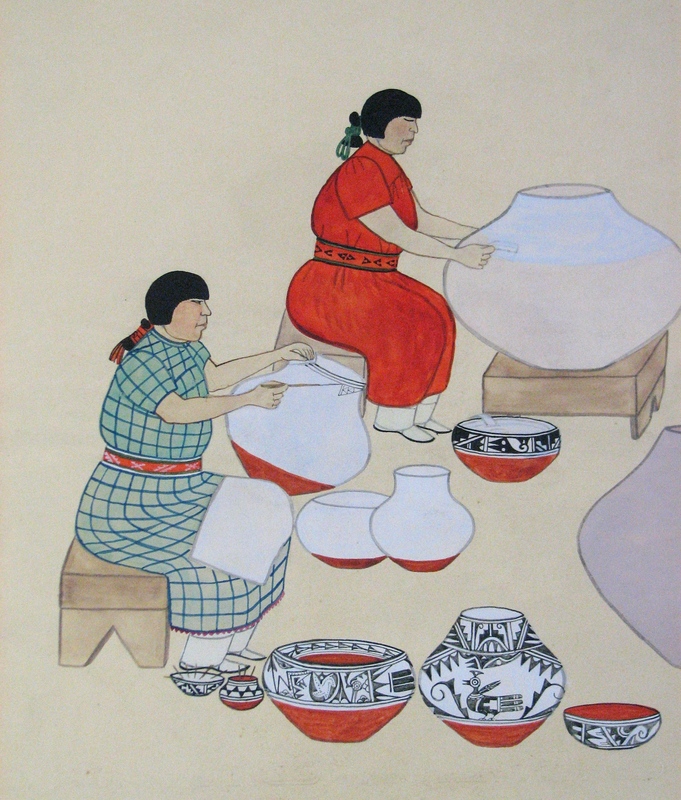 Tonita was the only woman in the group of talented early pueblo artists referred to as The San Ildefonso Self-Taught Group, which included such noted artists as Julian Martinez, Alfonso Roybal, Abel Sanchez, Crecencio Martinez, and Encarnación Peña. By the time Tonita was 25 years old, she was a successful easel artist, and her work was being shown in museum exhibitions and in commercial art galleries in Santa Fe and Albuquerque. 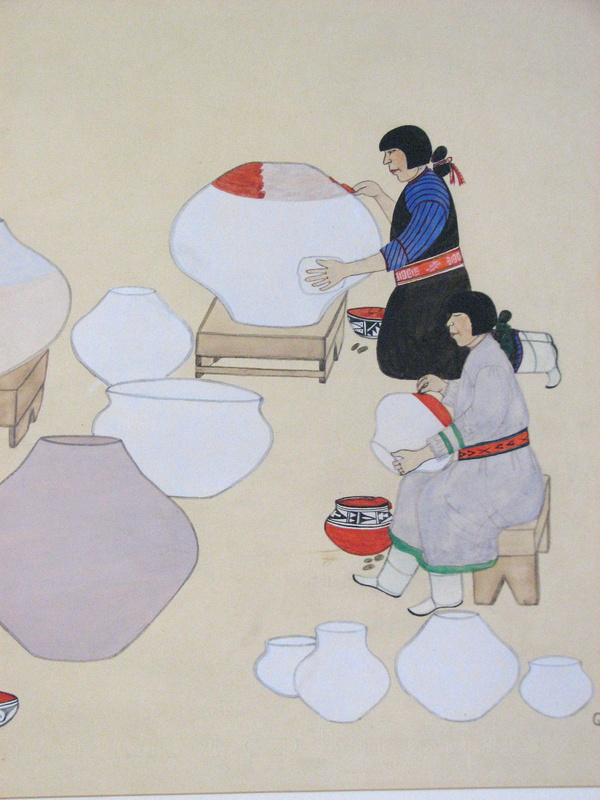 She painted what she knew best — scenes of life at the pueblo — mostly ceremonial dances and everyday events. She is still considered one of the best female Indian artists of all time. 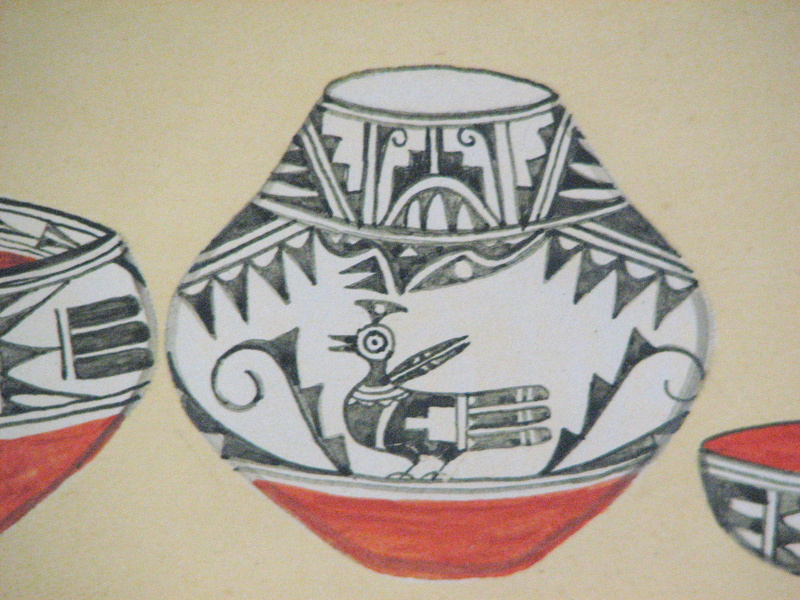 This entry was posted in Collection Notes and tagged A-Z, Cleora Helbing, museum collection, Native American art, Qua-ah, Southwest Pottery, Tonita Pena. Bookmark the permalink.